Guster takes a leap forward while remembering what makes them a strong band, working the best of then and now into Evermotion. Guster have never been an especially “active” band if judged by the quantity of their recorded output. 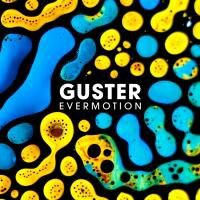 With 2015’s seventh offering, Evermotion, Guster is found settling into a laid-back groove. Since Easy Wonderful, they have gained a member (Luke Reynolds) and left the major label world behind. What results is a fine reminder that quality over quantity is a goal worth striving for. Leaving the major label world behind seems to have given Guster just the shot in the arm they needed. While Easy Wonderful is still a good album, it feels suffused with an energy far more buoyant than has been seen before on any Guster record. This is not to say that they can’t do buoyant and happy well -- they can. With Easy Wonderful, however, it feels somewhat forced; whether this was a case of cliche “major label meddling” at work is hard to say. Whatever the answer is, Evermotion brings the brooding, compelling atmosphere they mined so well on their first three albums back to center stage. Opener “Long Night” is all echoing dark space, plinking xylophones echoing away as discordant guitar riffs build to a sleeper of an opening track that sounds ripped from the Lost and Gone Forever days; it builds on all the strengths they have gained as a band since then, painting a very clear picture of what lies ahead. Almost as if to balance things out, “Endlessly” may still be a classic trying-to-save-a-relationship tune, but the uplifting music buoying the lyrics makes it a welcome, hopeful jolt of energy. Longtime fans will surely appreciate that Rosenworcel has broken out the bongos again, after seemingly having them buried in a closet somewhere for the last three albums. But far from being a tired slog into old ideas, these are blended in with the warm pop sensibilities that have become Guster’s signature sound over time. That signature seems to have taken the nearest time machine available back to the '80s for lead single “Simple Machine”. The allusions to how they’ve changed could refer to nearly anything: their newfound happiness in family life, or how they’ve grown as a band -- take your pick, really. All of this is pleasant enough lark, yet it seems to feel a bit “busy” compared to the rest of the album. While '80s vintage synths can sound great, this track over-uses them at times. The flip side of this coin comes a few tracks later with the more tight "Gangway", as fine an embrace of the chaos of major life changes if ever there was one. Conspicuously absent this time around are the more bold-faced examinations of religion, faith, and what it means to believe (see Easy Wonderful’s slight but haunting and cuttingly beautiful “Stay with Me Jesus"). This is not to say they’ve lost their touch for thoughtful tunes; this time around, they’ve buried the insights under a darker exterior than most listeners would expect to be hearing. One doesn't have to stretch to say that Evermotion is an album that takes a few listens to really sink in, but when it does, the power is real, and all the more clever for how these insightful bits and pieces are woven into each song. Guster took a chance this time out, and it paid off. Where it would have been easy to coast on the effortless charms of Easy Wonderful and Ganging Up on the Sun, they instead chose the more interesting route, resulting in an album that makes for a promising start to their next phase.